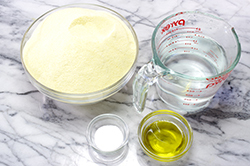 Line two baking sheets with parchment paper and dust with semolina. 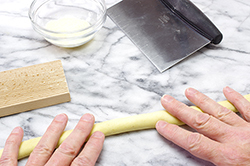 Cut off a chunk of dough about the width of two fingers and leave the rest covered with plastic wrap. 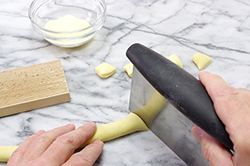 On a work surface very lightly dusted with semolina, use your hands to roll the chunk into a log about ½ in (12 mm) in diameter. 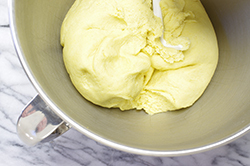 Do not incorporate too much more semolina into the dough, adding just enough so the dough does not stick to the surface. Cut the log into 1/2- to 1-in (12-mm to 2.5-cm) pieces. 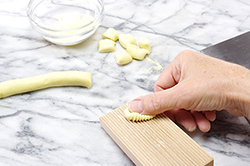 With the side of your thumb, gently push each piece against a gnocchi board or the back of the tines of a fork, rolling and flicking the dough to make a curled shape with an indentation on one side and a ridged surface on the other. 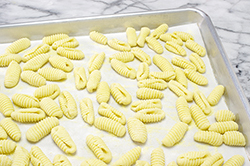 Put the cavatelli on the prepared baking sheets and shape the remaining dough. Make sure that the cavatelli don’t touch or they will stick together. 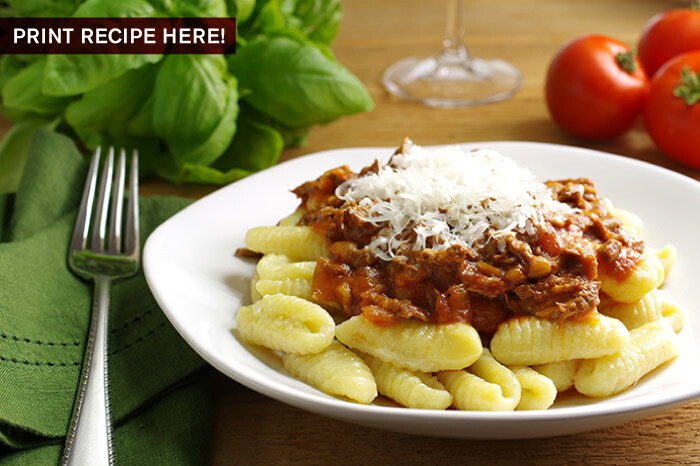 This hearty sauce is deeply savory and intense. The richness and complexity of the slowly cooked beef brisket and tomato paste complement the rustic dumplings and showcase the true craft that goes into Italian home cooking. Ground lamb shoulder or beef chuck can be substitute for the brisket – just check the meat as it cooks, because different cuts will cook at different rates. When the meat is finished cooking, it will be completely separated from the fat and full of rich, concentrated flavor. 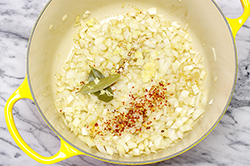 In a large pot, warm the olive oil over medium heat. Add the pancetta and beef brisket and cook, stirring occasionally, until the meat is cooked and browned bits stick to the bottom of the pot, 8 to 10 minutes. If the drippings on the bottom of the pot become too dark or look like they will burn, lower the heat. 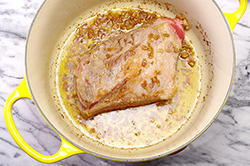 With a slotted spoon, transfer the meat to a bowl, leaving about 3 Tbsp fat in the pat and discarding any excess. Add the onion, garlic, bay leaves, and red pepper flakes and sauté over medium heat until the onion is translucent but not brown, about 4 minutes. The moisture from the onion will help deglaze the pan (dislodge the browned bits). 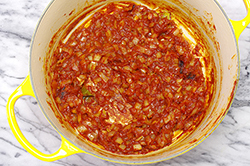 Add the tomato paste and cook until the tomato caramelizes (it will begin to stick to the bottom of the pan and turn dark red), 4 to 6 minutes. If the tomato paste gets too dark, lower the heat. Add the wine, raise the heat to medium-high, and bring to a simmer. Use a wooden spoon to scrape up the browned bits from the bottom of the pot and simmer until the wine has almost completely evaporated, 5 to 7 minutes. Add the chicken stock and bring to a gentle simmer. 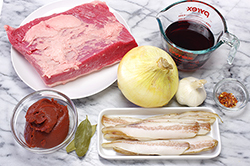 Return the meat to the pot, turn the heat to medium-low, and simmer gently – the liquid should bubble lazily – until the meat has become tender and the sauce has gradually reduced and become rich. Be patient; this will take about 3 hours. Be careful not to let the sauce boil. If the sauce becomes too thick, add up to 1/2 cup (120 ml) additional chicken stock. Season lightly with salt and pepper and discard the bay leaves. To finish dumplings with the ragù, for each serving, warm about 1/2 cup (120 ml) of ragù in a sauté pan over medium heat and add 1-1/2 tsp to 1 Tbsp butter per serving, depending on how naughty you feel. Gently simmer about 4 minutes, until the bubbles get large and the sauce is not watery along the edges of the pan. Add the cooked dumplings and simmer for 1 minute to let the dumplings absorb the flavor of the sauce. Top with grated Parmigiano-Reggiano cheese and season with salt and pepper. Serve right away.